Any time someone gets access to PRODUCT A (either through direct signup, manual admin add, or purchase), then you can automatically give them access to PRODUCT B. And you can select whether they get PAID access to PRODUCT B or not. Similarly, when someone is removed from PRODUCT A, you can also tell DAP to automatically remove their access to PRODUCT B. Very useful for bundling products. User signs up as free user to PRODUCT A. Later on, user buys PRODUCT B (which is, say, paid version of PRODUCT A). 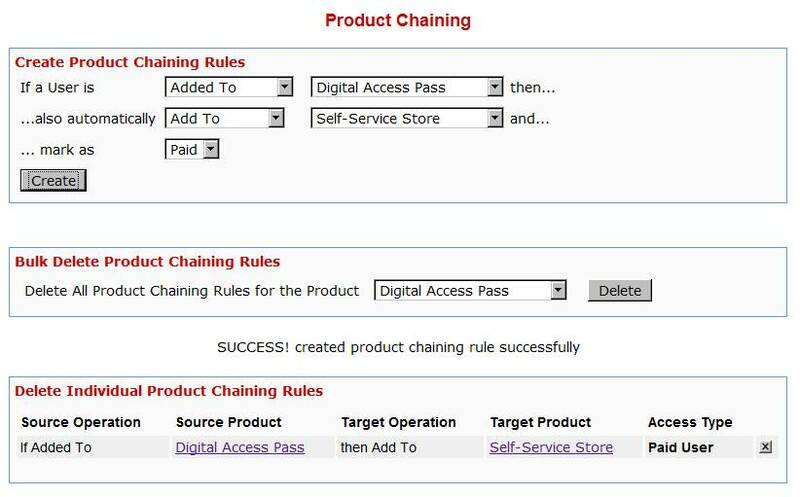 If you set up Product Chaining, then you can automatically remove them from PRODUCT A when they purchase PRODUCT B. So when you send an email to all PRODUCT A users asking them to purchase access to PRODUCT B, then you won’t be sending emails to those who have already purchased PRODUCT B.
Click on image below to open full size in a new window.